In response to overwhelming demand from Slick Trade members we’re delighted to announce the release of the new DAVINCI DONCHIAN HOURLY SIGNALS for the NADEX platform. IMPORTANT: These signals are a modification and upgrade on the popular signals formerly known as NADEX Solutions. As you may know the solid trade performance of these signals, 85% to 94% win rate, is based on trading them using the Support and Resistance method with the Donchian indicator template for MT4. You asked, we listened! In our continued commitment to providing the very best service for our valued members, we’ve taken care of the heavy lifting on your behalf. NOW YOU CAN TRADE THE SIGNALS AS DELIVERED WITHOUT HAVING TO FIGURE OUT PREVIOUS SUPPORT OR RESISTANCE LEVELS. Here’s a quick reminder of how to take the new Davinci Donchian signals. 4. ENTER WORKING ORDER – Or grab at market price! Many times, if you are patient or if you enter a working order, then you can get a more lucrative position. Our trade signals normally reach an ITM ($20 profit per contract) or ATM ($40-60 profit per contract) before expiration of the trade. How Do Other Members Prefer To Trade This Strategy? Many of our members prefer to set multiple WOs for each signal sent out. This way, they are staying more profitable and by setting WOs, they do not have to sit around a computer all day chasing trades. If the WOs fill then great! If not, then he moves on to the next trade. (This is something you will want to demo before going live with, but it is a great approach to taking these trades…another thing to think about is that if a trade does go against you on the ATM level, the ITM trades can make up for a loss very easily). Many of our member also prefer to take multiple strikes for each trade signal. She set a WO for each strike price with a risk to reward of 75/25, with the exception of the two that are starred. She set a WO for 65/45 for the two that are starred. The reasoning that she did this is because the signal was already quite deep ITM when the trade set up. She took a look at her chart for a visual and saw that the previous support was at .7204, so she decided that she would set a lower risk to reward WO for the higher strikes because price may not have reached the other strikes. 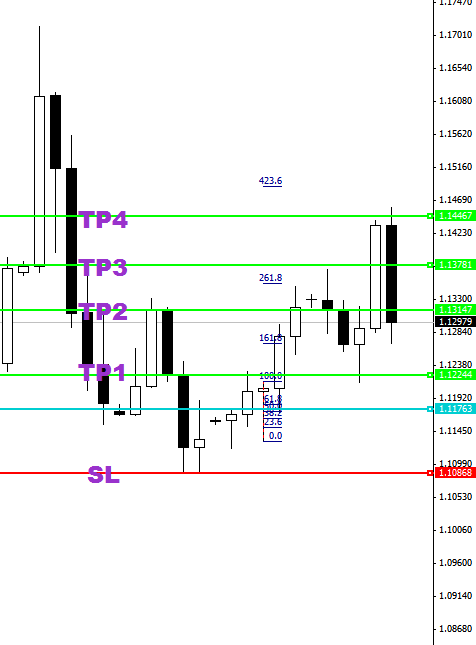 (This is something you will want to demo before going live with, but it is a great approach to taking these trades). Many of our members simply stick to the traditional method of taking the trade signals. Sets a WO of 75/25 or better for each trade signal – 10 contracts per trade.